A pupil finds that 81 per cent of mushrooms are treated with bleaching chemicals. The Beijing Municipal Food Safety Office’s counter test says the opposite, but people believe the pupil. In the melamine-tainted milk scandal, parents are forced to beg to pay for medical treatment, whilst the whereabouts of children rights’ activist Zhao Lianhai are unknown. Beijing (AsiaNews/Agencies) – In the latest chapter in China’s never-ending tainted food scandal, a test indicates that about 81 per cent of mushrooms on sale in the Chinese capital are bleached with harmful chemicals. In a related story, activist Zhao Lianhai has disappeared after he was sentenced last month to two and half years in prison for seeking justice on behalf of the children poisoned in the melamine-milk scandal. The latter’s families have not yet received any adequate compensation to pay for the expensive medical treatment the children require. Zhang Hao, an 11-year-old Beijing primary school student, loves mushrooms. In February, his mother barred him eating them after she heard media reports saying some were bleached. Since he could eat them, young Hao decided to study them. 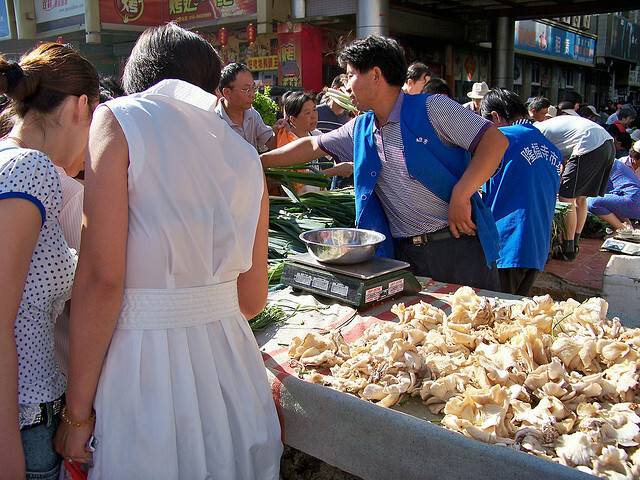 He randomly picked 16 types of mushrooms sold in local markets, including 14 samples of fresh ones and two dry ones. Using a microscope, he looked for contamination with bleaching agents, working under the supervision of a PhD student in a microbiology laboratory at China Agricultural University. His findings were dramatic. Bleach was used on 13 of the 14 fresh mushrooms; the dry mushrooms were found to be untainted. Consuming bleaching chemicals can damage the liver and trigger asthma and skin allergies. The information was front-page news in dozens of national newspapers. However, the Beijing Municipal Food Safety Office followed up with a survey of its own that found that more than 97 per cent of mushrooms on sale in the capital were free of bleaching agents and were safe to eat. Most consumers are sceptical however about official claims. In an internet survey, more than 1,100 people said they believed the boy's results whilst only eight said they had confidence in the city's Bureau of Industry and Commerce. The reason is simple. Most people in mainland China have seen too much fruitless action by food safety agencies in response to too many food scandals. By and large, the authorities try to cover up the scandals and squash the stories. For example, in September 2008, a scandal broke out involving milk tainted with melamine, a chemical used in making plastic that is highly toxic in humans. At least six children were killed from drinking tainted baby formula and additional 300,000 suffered various degrees of illness. Initially, the government pledged free medical care and compensation, partly to appease an angry public. Later however, it reversed itself and offered puny compensation packages—2,000 RMB US$ 300) for every sick child, 30,000 RMB (US$ 4,500) for the worst cases and 200,000 RMB (US$ 30,000) for the families of the six dead children, far short than what is needed for most families to meet expensive medical treatment. Many parents refused the offer and sought instead compensation through the courts. Here, they met a brick wall, because judges refused to address their claims. Many families are now forced to beg to pay to raise money for the children’s treatment. Some parents have begun monitoring the quality of milk. As soon as problems arise, they contact producers and threaten to go public with the information. This way they can get some money to pay for their children’s medical treatment. Zhao Lianhai, whose child was poisoned by melamine-tainted milk, tried to organise parents to seek justice for their children. He set up a website to raise awareness about the issue but was arrested, tried and convicted last 10 November for “disturbing public order”. This has led to international protests. Zhao’s whereabouts are now unknown. At the same time, the authorities have revoked his lawyers, who have been unable to see him, let alone issue an appeal on his behalf. On 23 November, state-owned Xinhua reported that he would be released on medical grounds, but that has not happened yet. Meanwhile, Zhao’s wife has been under de facto house arrest and close police watch.